Wow!!! Awesome shots…..been watching a bit…. YOu didn’t get a shot of my son Zach who is a ball boy there. When I asked him how many years he’s been a ball boy he told me this year was his Balls Mitzvah! I am so jealous..have been watching the Open non-stop!! Benny is as handsome as ever!!! How cute is that Benny Boy. 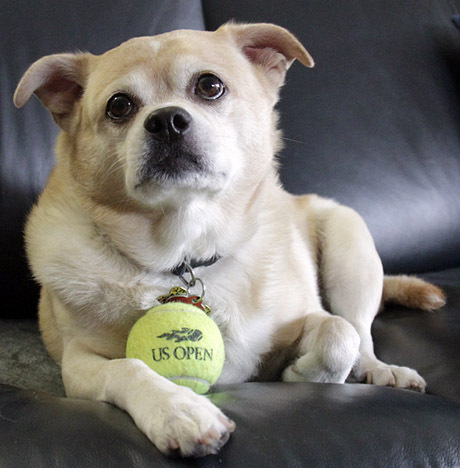 Wouldn’t he be a cute ball boy/dog. Your photos are terrific- great action and shadow shots. I especially like the bottom one above your name. Final packing steps and then off this afternoon- getting in at 9:35 so I’ll be opening my eyes to Evanston first and then Chicago proper mid week. We’re going to spend the first couple of days including Alison and her apartment redo and lots of walking. I’m so looking forward to this time of NOTHING. NO doctor, dentist, lab, mother- you get the picture. Chat when I’m back. Have a fun time this week and remember to eat your lunch and bring your mittens. Love it!!!! amazing shots as always! !